The threat for rain has ended. Pleasant weather is expected right through the first half of next week. Today and Tonight: Expect skies to clear early on Friday with ample sunshine by afternoon. Thanks to northwest winds of 5-10mph behind a cold front, high temperatures will struggle to reach 70 degrees. A brilliant evening for high school football is ahead with temperatures tumbling through the 60s beneath clear skies. Lows will end up in the low 50s Saturday morning. Up Next: The weekend is in fine shape with plenty of sun expected each afternoon. Saturday will feature highs in the mid 70s. The Southern Jags will enjoy nice weather as they play host to Jackson State for a 6pm kickoff Saturday evening. Take a jacket into the stadium as temps will drop off into the 60s. Sunday will be milder with thermometers starting in the mid 50s and getting close to 80 during the afternoon. Monday and Tuesday will be clear and cooler thanks to a reinforcing cold front that will pass by dry. Lows could dip into the upper 40s by Tuesday morning. Looking Ahead: The next storm system looks like a doozy. While it is simply too soon for specifics, early indications are that another cold front will cross the area. Rain and thunderstorms, possibly strong, can be expected. Wednesday or Thursday appears to be the target timeframe; but of course, a faster front could affect Halloween plans. Behind that front, yet another round of unsettled weather is showing up on forecast models. This just looks like light to moderate rain but it is in the Friday or Saturday timeframe, which could affect football games next weekend. 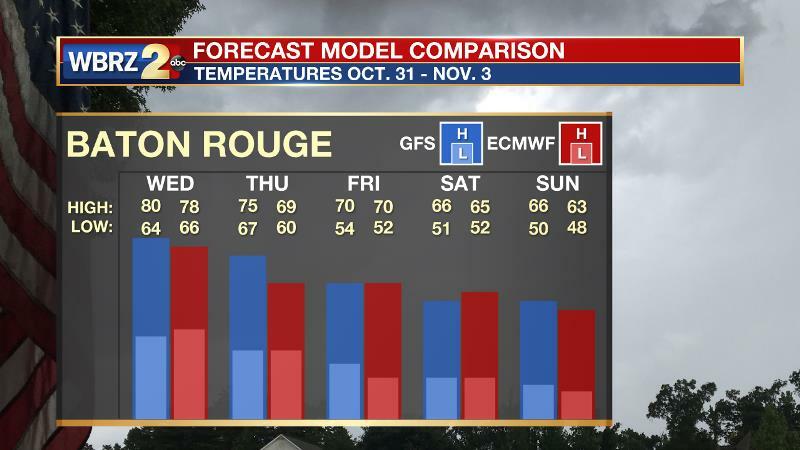 One thing that forecast models do agree upon—much cooler air is anticipated into next Saturday and Sunday. The Tropics: Shower activity associated with a low pressure system centered about 1000 miles east-northeast of the northern Leeward Islands has become more concentrated during the past several hours. 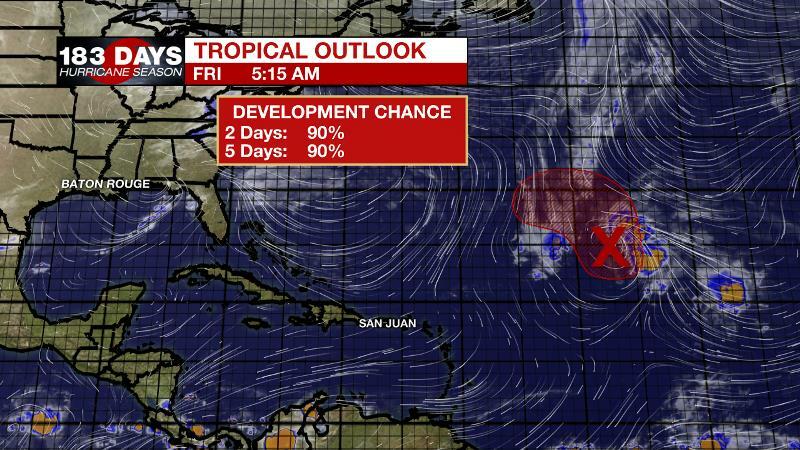 The low is expected to move generally northward over the next couple of days into an area where environmental conditions are forecast to be conducive for further development, and there is a 90 percent chance that a tropical or subtropical storm forms by the weekend. After that time, the system is forecast to turn westward well to the north or northeast of the Lesser Antilles through early next week. Surface high pressure will build into the region as Thursday’s front exits east. Cooler and drier air is expected leading into the weekend. The lowest temperature will come Friday night beneath clear skies with light winds. Thermometers will fall into the upper 40s for areas north of I-12 and into the mid 50s across areas south. Some thermal modification is expected over the weekend as surface high pressure moves east of the area ahead of a reinforcing cold front. There will be a brief warming trend in both overnight lows and afternoon highs with Sunday seeing the warmest temperatures—near 80 degrees. The models have really backed off with the idea of what was formerly another cold front pushing through the region Sunday night into Monday morning. While this system would be moisture starved and not produce any rain, it had looked like temperatures would cool off quite a bit, but now models suggest very little cold air advection. This is expected to maintain above average temperatures through Wednesday. The next storm system will then begin to develop and warrants attention. A potent 500mb trough will dig into the Mid South, pushing a cold front into the southeastern United States. This appears to be the deepest trough so far this fall season. Depending on the position and orientation of the trough, it could bring a threat for strong thunderstorms as well. 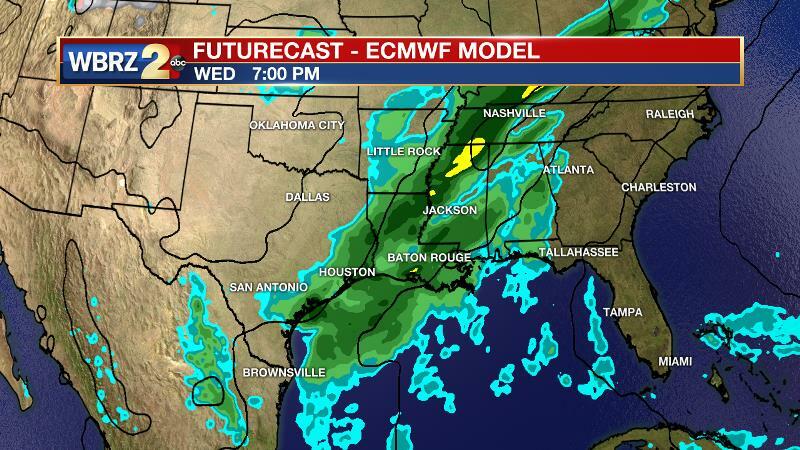 So far, timing this system with forecast models has been problematic, but those details will become clearer next week. Right now, trick-or-treating could be in jeopardy as scheduled since forecast models are bringing the system through rather quickly on Wednesday evening. Another system may trail that front with some showers and this would need to be monitored for the big game in Tiger Stadium next weekend. Amidst the uncertainty, there is forecast model agreement that much cooler temperatures will arrive in the Friday/Saturday timeframe.